Wordless Wednesday – Screw the Schedule! We’ve had a rough go of it with daylight savings time, and today was our attempt to get back on schedule. We ALMOST made it, but I thought we should watch the end of his favorite movie (as if he hasn’t seen the end 100 times already!). How can one be expected to go to bed on time when “The Lo.rax” is on? Is this the Lorax? Chloe just saw it for the first time two days ago and it’s quickly become her favorite. I’ve only seen a few minutes of it, but there is a song that comes on where this guy is playing the guitar and the bears start dancing. She will stand up as soon as the music starts and start dancing herself, it’s adorable! I love how Matthew is sitting and seems so intent on finishing his movie. Love pillow time on the floor! Yes it is! This is the favorite EVERY.SINGLE.DAY. I love watching these kids dance to movies and music! Matthew dances to the old Blue.s Clu.es videos too and that cracks me up! Aww… what movie?? I wish Lids would sit still and watch a movie or more than 5 minutes of one! Hope things are getting back on track now. We didn’t even have a time change here but Lids seems to think we did!!! 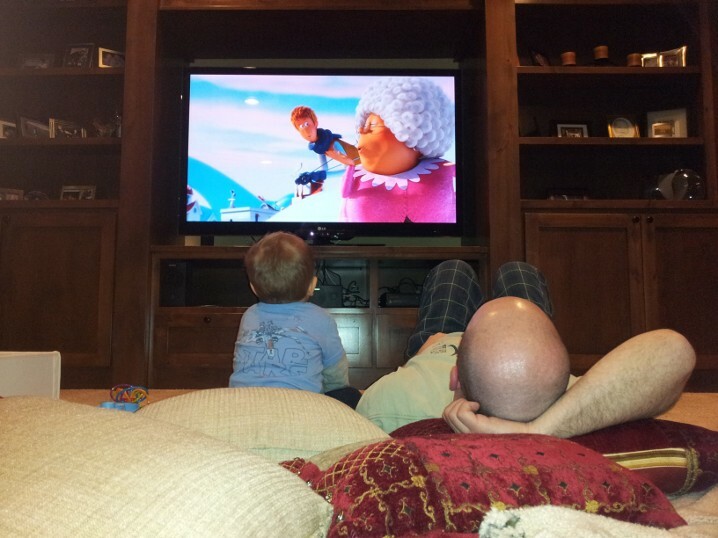 That’s the Lorax – best movie for kids! It has a great message and is just positive in tone and nature. I think it’s my current fave right now! Give her time. She’ll like movies and shows soon enough, and then you’ll wish you didn’t ever let her get started. L loves the Lorax too! Hope you guys get back on schedule soon. it’s been an off week over here too. Thanks! We’re back to a schedule now, but it’s not the same one we were on. That’s what next week is for. HA!